It occurred to me that today’s 1969 archive won’t mean very much to anyone under 50 who would have grown up swimming at the Ken Marriott Leisure Centre. But by coincidence, last week John Groucott sent me a lot of pictures from slides his late parents Monica and Jim had taken around the town - and these two of Regent Place and the old swimming baths were among them. I’ll have room to tell you more about the Groucotts when I use another from their collection, but in the meantime you can see the baths stood where Jubilee Gardens and the Rupert Brooke statue is now. The snowy one was taken in 1960. 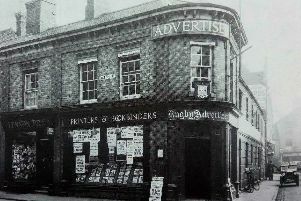 John says his father lived in a flat at 34 Regent Street when he first came to Rugby so assumes this view was taken from there.